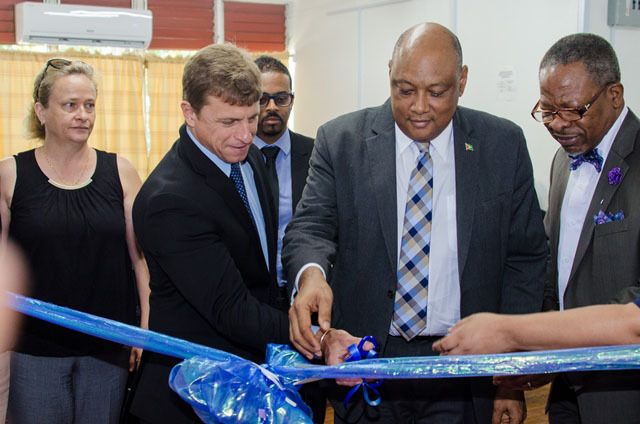 With the advent of the oil and gas sector in Guyana, the University of Guyana (UG) is now equipped with a Geotechnical computer lab which will serve hundreds of students, according to the Department of Public Information (DPI). The lab will benefit students from the Petroleum Engineering, Mining, Geological Engineering and Civil Engineering Departments in the Faculty of Engineering and Technology. Delivering remarks at the officiating ceremony, Minister of Natural Resources, Raphael Trotman said “The students of the University of Guyana will undoubtedly climb to higher heights as a result of this collaboration. The Government of Guyana through the Ministry of Natural Resources remains committed to the long-term partnerships of this premier institution that is responsible for shaping the minds and lives of our young people”. Managing Director of Schlumberger for Trinidad and the Caribbean, Sean Herrera underlined. the company’s commitment to enhancing educational opportunities and training for Guyanese. Schlumberger Limited is an oilfield services company. “Schlumberger is pleased to be donating computer workstations and Petrel geoscience software licenses. This embodies the aforementioned commitment by Schlumberger to educational development,” Herrera stated.